At this time of year not only 'tis the season to be merry, but it's also time for studios, networks and streaming services to campaign in the city skyline for the winter awards season. 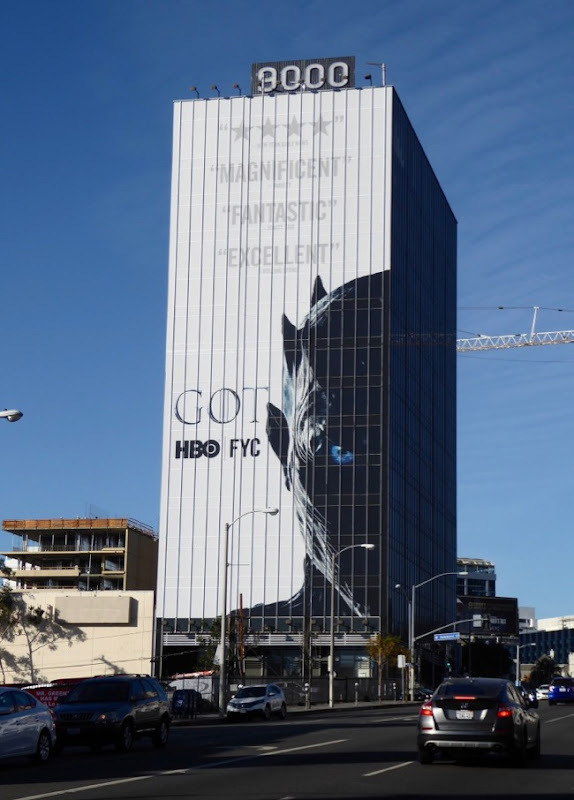 With the Critics' Choice, Golden Globes and Screen Actors Guild Awards nominations all to be announced in December, HBO is back in the skies with a company wide cohesive outdoor ad campaign for all its original shows and telefilms. Game of Thrones missed the window for Emmy consideration this year due to its air date, but it's back in full force for its seventh season and looking for some consideration from the television industry. 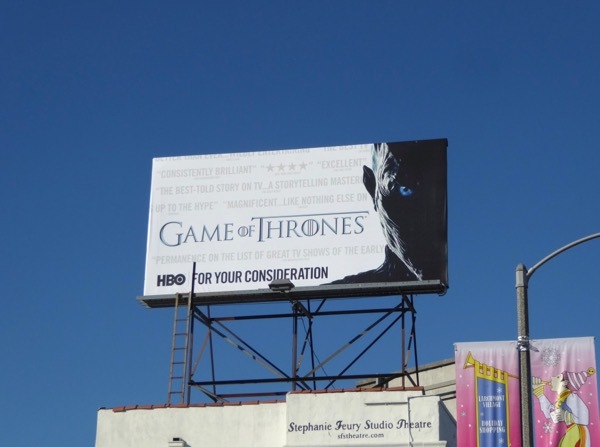 The small landscape ad for the epic series based on George R. R. Martin's fantasy books was snapped along Melrose Avenue on November 18, whilst the giant-sized version featuring the White Walkers 'Night King' was photographed looming large over westbound traffic along the Sunset Strip on November 28, 2017. 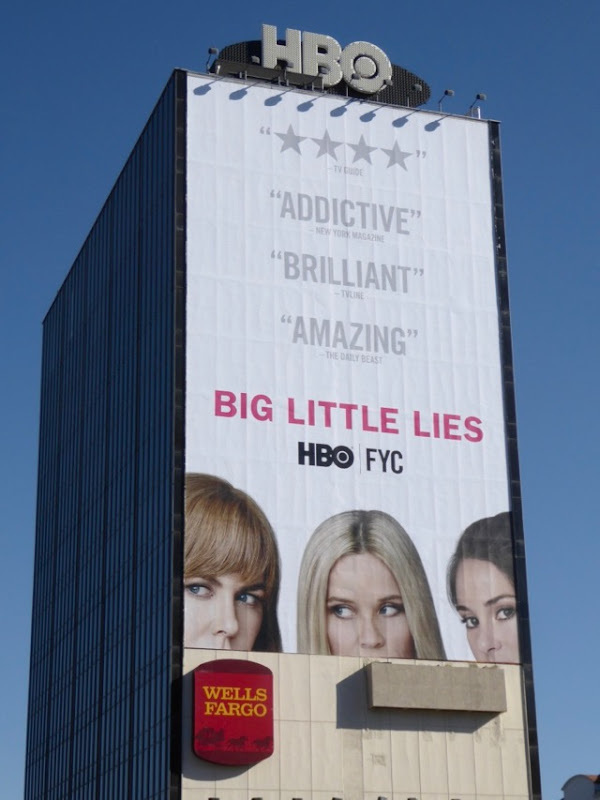 HBO is certainly getting good value out of their season key art and filling the white backgrounds with evocative quotes from critics and the media. 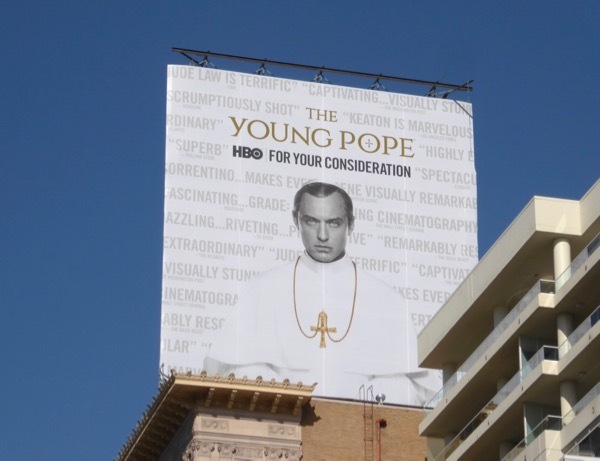 Jude Law was The Young Pope in HBO's modern day papacy mini-series at the beginning of the year and will return in a follow-up second limited series, The New Pope, so a few industry accolades would be a great profile boost for the drama. 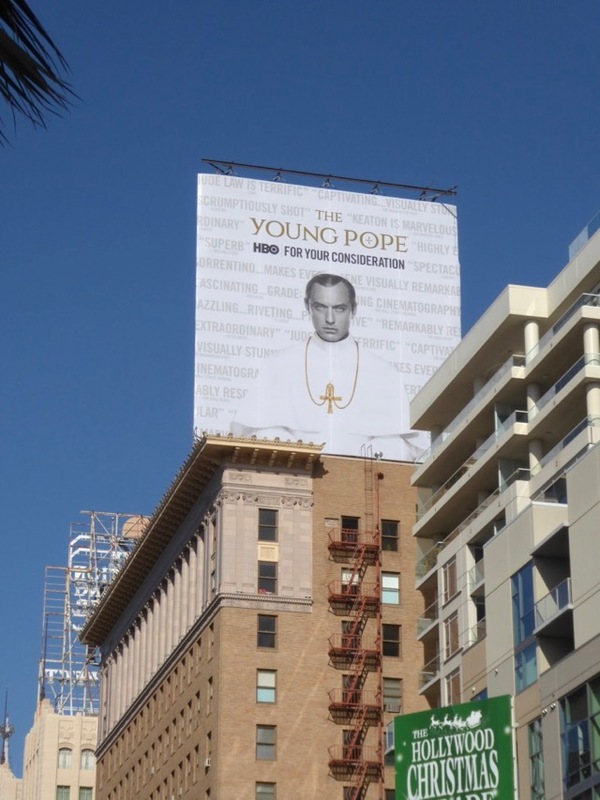 This 'For your consideration' billboard for The Young Pope was spotted high above Hollywood's Vine Street on November 18, 2017. 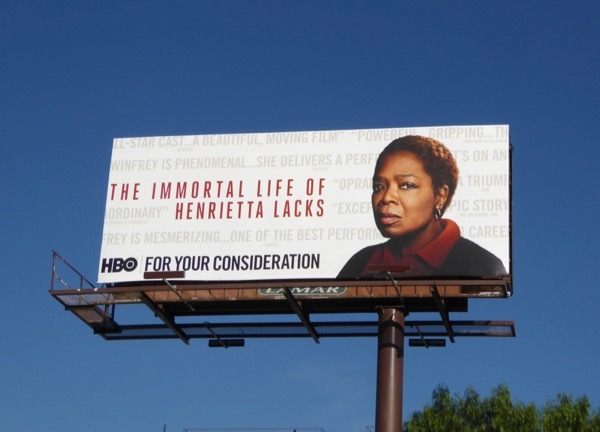 In addition to all its quality television series, HBO also had several telemovies this year with high-profile casts, including The Immortal Life of Henrietta Lacks starring Oprah Winfrey. 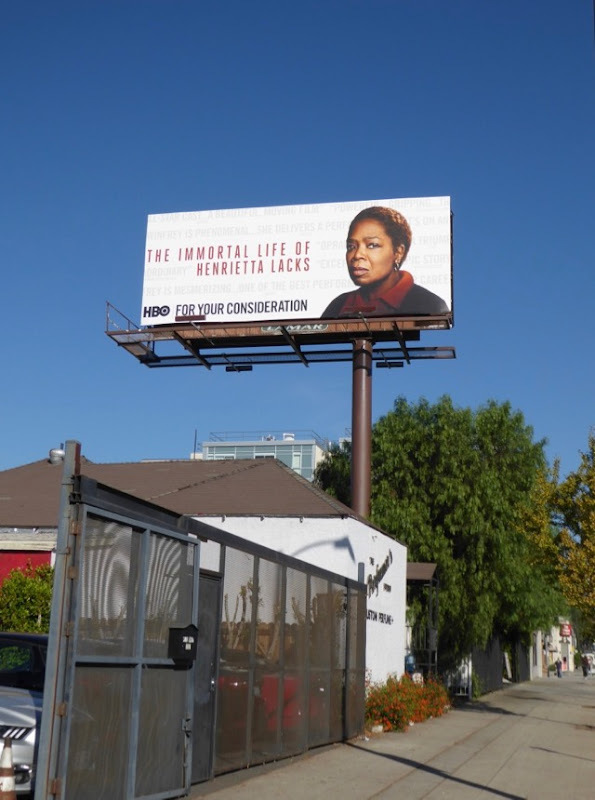 This FYC billboard for the Emmy-nominated biopic was photographed along Highland Avenue on December 1, 2017. After six years off our screens, Larry David returned this fall with a ninth season of the acclaimed hit comedy Curb Your Enthusiasm. 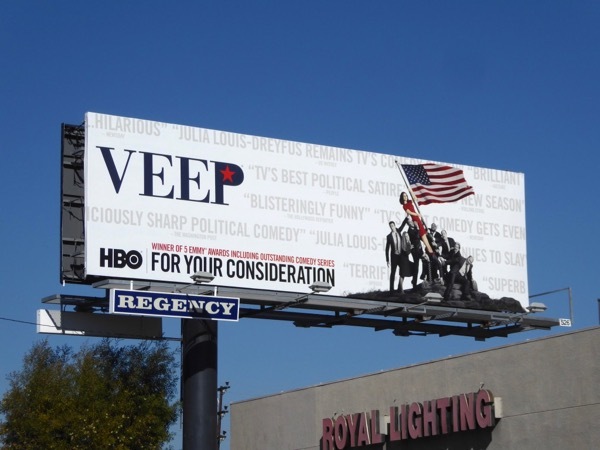 This awards consideration billboard for the revived show, which is almost like a negative of the season nine key art, was spotted along Hollywood's Sunset Boulevard on November 18, 2017. 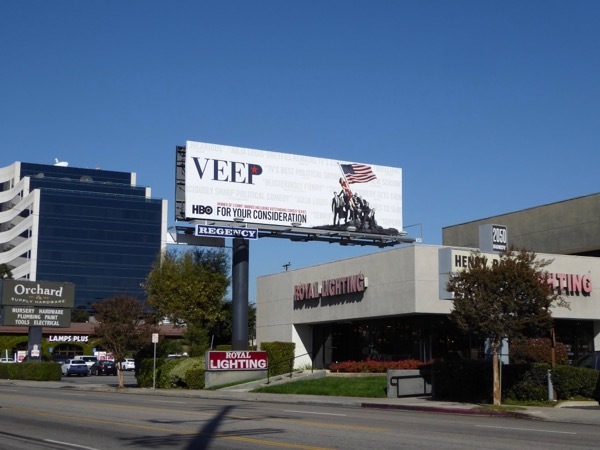 In a world turned upside-down this year by a catastrophic real-life election result, political satire Veep returned for a sixth season with Emmy-winning actress Julia Louis-Dreyfus reprising her role as 'Selina Meyer' for a penultimate season. 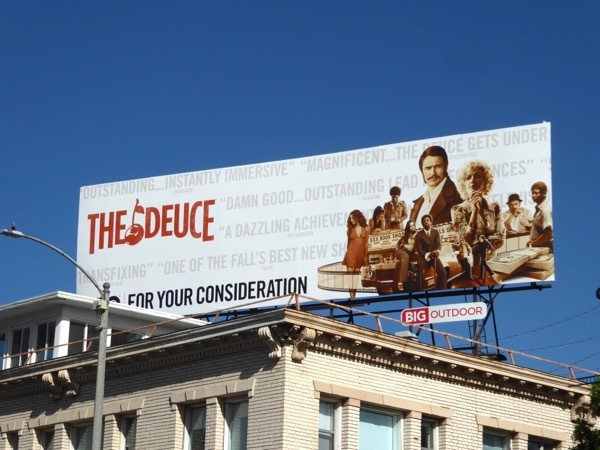 This FYC billboard for the multiple Emmy-winning comedy series was spotted along Bundy Drive in West L.A. on December 1, 2017. Silicon Valley maybe be losing a founding character in the form of T.J. Miller after the latest fourth season, but can the tech startup comedy garner some more awards nominations and wins this season. 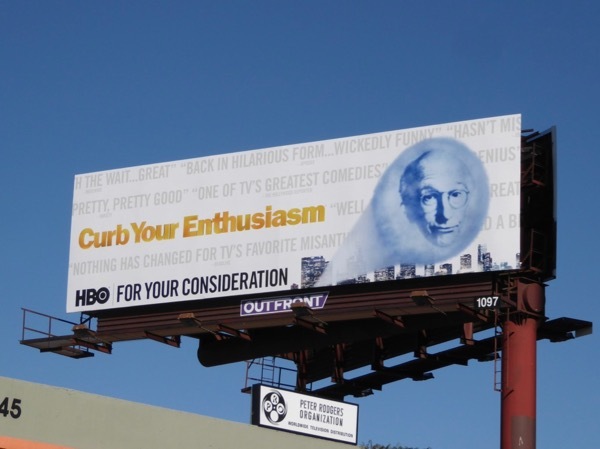 This awards consideration billboard for season four of the HBO comedy were spotted along Santa Monica Boulevard and Pico Boulevard from November 18 to December 1, 2017. Issa Rae's comedy Insecure may have been snubbed by the Emmys this year, but let's see if she can receive another Golden Globe nomination for the hit show's sophomore season. 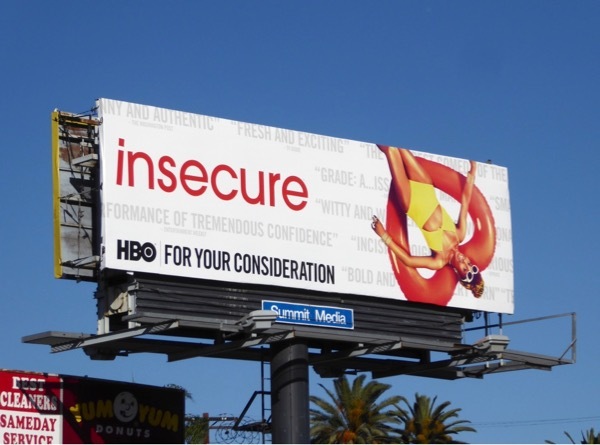 This eye-catching consideration billboard for the second season of Insecure was spotted floating above Highland Avenue on December 5, 2017. 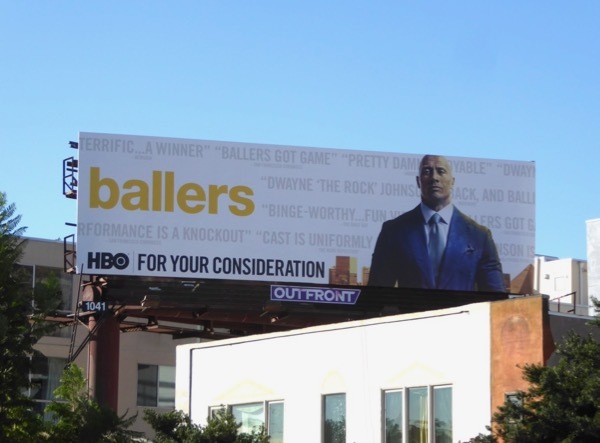 When he's not racing cars in the Fast & Furious movies or rebooting film franchises like Jumanji, one of the busiest people in Hollywood, Dwayne 'The Rock' Johnson is starring in the HBO American Football comedy drama, Ballers. 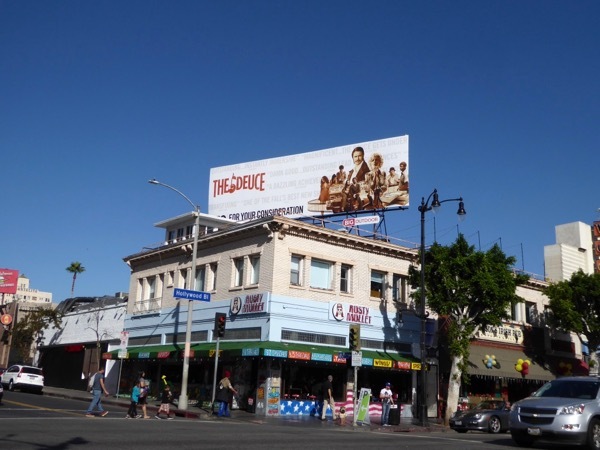 This FYC billboard for the series third season was snapped above Fairfax Avenue on December 5, 2017. 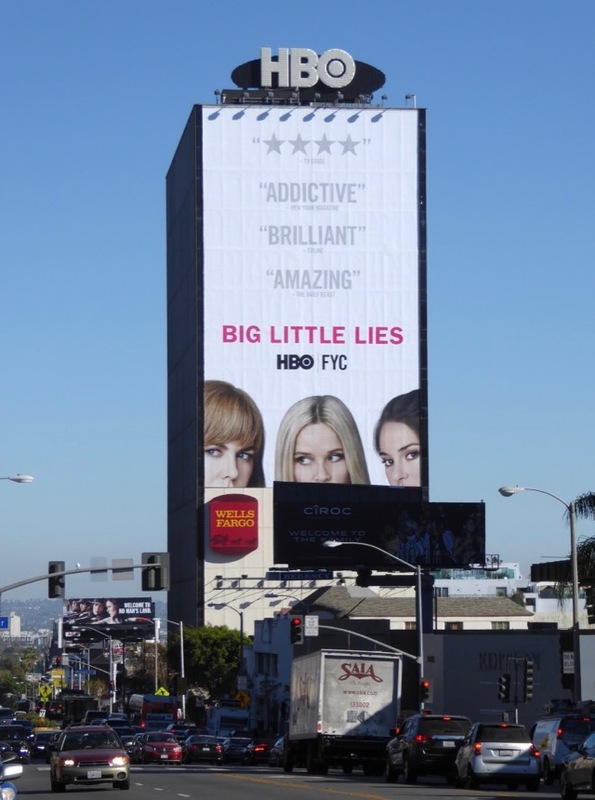 HBO's star-studded limited series, Big Little Lies, was big hit with audiences and critics alike, taking home eight Emmy wins, with rumblings of a sophomore season on the way. Can the drama about motherhood, secrets and murder in Monterey, California, garner even more accolades this winter awards season? 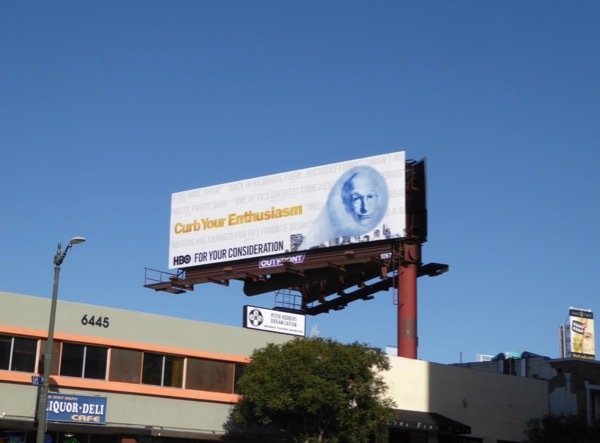 These giant-sized and landscape FYC billboards were photographed along the Sunset Strip from November 28 to December 1, 2017. 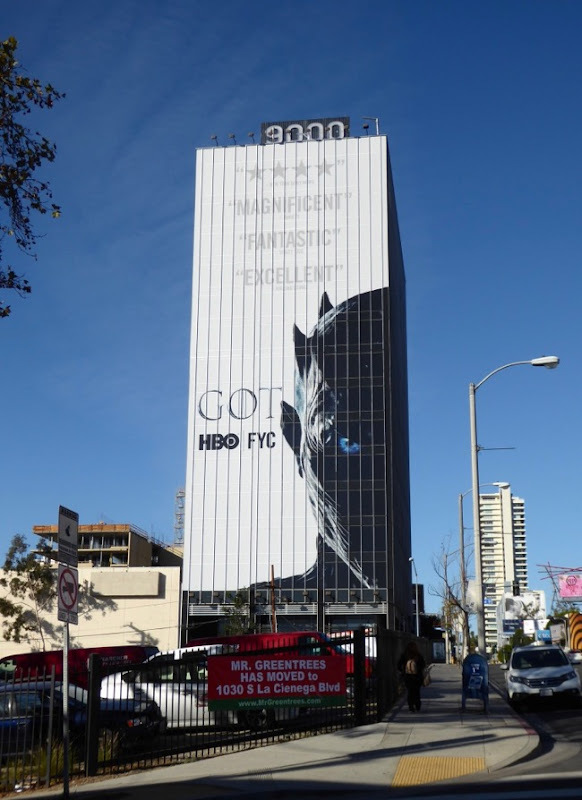 As you can see from all these examples HBO has a big outdoor presence in L.A.'s sprawling skyline this holiday season, just like with its Emmy consideration awards campaigning, so let's see if all these ads pay off. 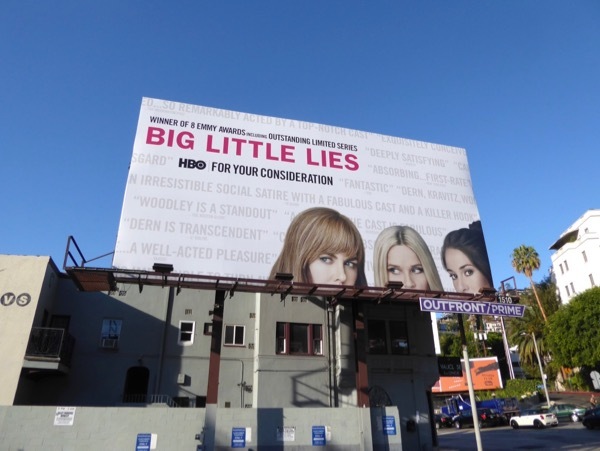 Daily Billboard has yet to see any HBO support for The Wizard of Lies TV movie, or the final seasons of Girls and The Leftovers, but you never know what you'll see driving around L.A., so watch this space. 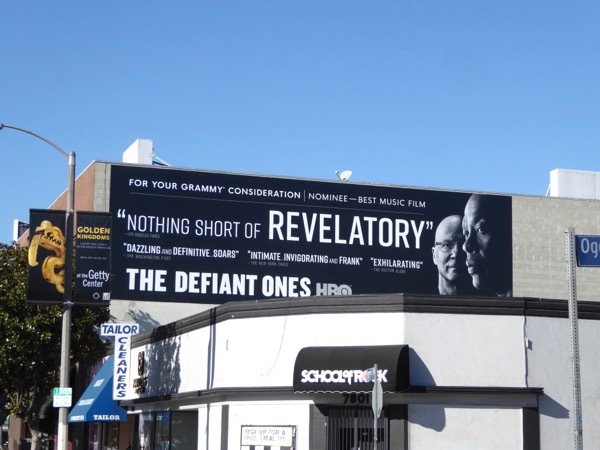 UPDATED: Here's also a Grammy consideration billboard for HBO's music business docu-series, The Defiant Ones, spotted along Beverly Boulevard on December 27, 2017.